The embedded Twitter handle is really Chelsea Manning. The account is being managed by a politically progressive public relations firm, but the tweets are hers. Last summer, I was listening to the local LGBTQ show and the hosts were going on about a regional Pride event and how many corporations were in attendance. After saying how great it was the companies had booths and how several of them had an element of fun, they wished there was more about the community's heroes. 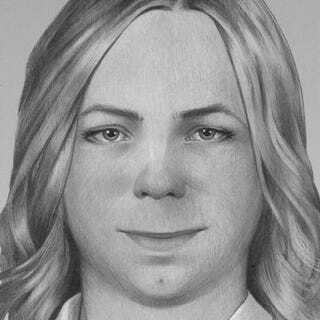 Ms. Manning was among those they listed. The linked Cosmospolitan interview, conducted through the mail, has more on her background, some about what her life is like now and a sample from the letters she receives from people with stories of their own. As an aside, it also reveals that she got birthday cards from Edward Snowden and Michael Stipe. I'm not sure, but the magazine might also have a new artist's rendering. The fact that there had been only one photo was also lamented on the radio.